When you get hold of your new A360, it’s in storage mode. It wakes up when you plug it into a computer for setup or a USB charger for charging. We recommend that you charge the battery before you start using your A360. If the battery is completely empty, it takes a couple of minutes for the charging to start. See Batteries for detailed information on charging the battery, battery operating times and low battery notifications. You can choose how to set up your A360, with a computer and a USB cable or wirelessly with a compatible mobile device. Both methods require an Internet connection. Mobile setup is convenient if you don't have access to a computer with a USB port, but it might take longer. Wired setup is quicker and you can charge your A360 at the same time, but you need a USB cable and computer available. Go to flow.polar.com/start and install the FlowSync software to set up your A360 and update the firmware if needed. Don't charge the device when its USB port is wet. If the USB port of your A360 has gotten wet, let it dry up before plugging in. 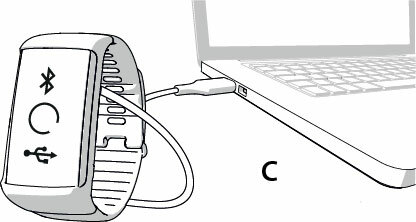 Plug the other end of the cable into the USB port of your computer for setup and charging the battery (C). Then we’ll walk you through signing up for the Polar Flow web service and personalizing your A360. To get the most accurate and personalized activity and training data, it’s important that you’re precise with the physical settings when signing up for the web service. When signing up, you can choose a language and get the latest firmware for your A360. When closing the USB cover, make sure it fits flush on the device. Polar A360 connects to the Polar Flow mobile app wirelessly via Bluetooth Smart, so remember to have it turned on in your mobile device. 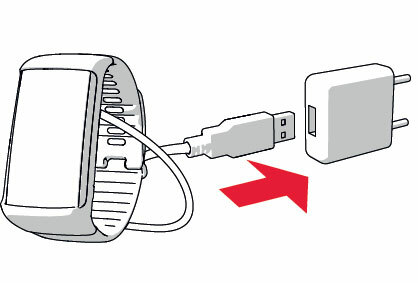 To make sure there’s enough charge in your A360 during the mobile setup, just plug the USB cable in a powered USB port or a USB power adapter. Make sure that the adapter is marked with "output 5Vdc" and that it provides a minimum of 500mA. The display begins to show an animated circle with Bluetooth and USB icons. Go to the App StoreSM or Google PlayTM on your mobile device and search and download the Polar Flow app. The mobile compatibility is available at polar.com/support. When you open the Flow app it recognizes your new A360 nearby and prompts you to start pairing it. Accept the pairing request and enter the Bluetooth pairing code from your A360 to the Flow app. Make sure your A360 is powered up in order to make the connection possible. Then create an account or sign in if you already have a Polar account. We’ll walk you through the sign-up and setup within the app. Tap Save and sync when you’ve defined all the settings. Your personalized settings will now be transferred to the bracelet. To get the most accurate and personal activity and training data, it’s important that you’re precise with the settings. Please notice your A360 may get the latest firmware update during the wireless setup, and depending on your connection it may take up to 20 minutes to complete. Your A360 will receive the language package according to your selection in the setup and it will also take some time. A360 display will open to the time view once the synchronization is done. You’re ready to go, have fun!